Rules of Golf: Which Club, How and When Can it Be Used? It was a bizarre incident at last week’s Hong Kong Open that gave rise to the heading above. Joonas Granberg, a Finnish professional golfer, was left standing on his first tee box, which unusually was on the 11th hole, ready to play. Unfortunately, his caddie had wrongly made his way to a different tee (presumably the 1st or the 10th) with his clubs, leaving Granberg holding only his putter, which he had been using for practice. When the caddie eventually made it to the correct teeing ground, it was too late and the Finn had already been disqualified under Rule 6-3, Time of Starting. I know that it is much easier to think rationally about a situation like this after the event, but nevertheless, if Grandberg had a good understanding of the Rules of Golf he should have realised that could have avoided being disqualified by using his putter from the 11th teeing ground. A player is not required to have either a caddie or their bag of clubs with them on their first teeing ground and the Rules do not place any limitation on what club may be used for making any stroke. (edit 11th December 2013: It has been suggested to me that Joonas Granberg may have been disqualified under a Condition of Competition that required a 'compulsory caddie', but I have not been able to verify this). A player may start a round with a single conforming club and may add any number, provided his total number does not exceed fourteen, Rule 4-4a. 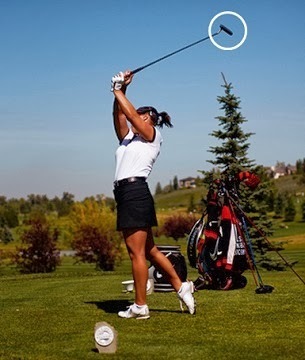 The photo above shows 7-time Canadian Long Drive Champion for women, Lisa Vlooswyk, hitting a putter from the teeing ground, apparently sending her ball over 200 yards. Other examples of using a ‘wrong’ club for a stroke are a pitching wedge on the putting green (definitely not recommended for most players), a wood from the fringe of the putting green, or a lob wedge from hard sand in a bunker. Personally, I have never played with a right-handed person that carried a left-handed club to use when they are faced with a difficult lie, but the Rules do permit it and I suspect that for many golfers this might be a preferable option to using a right-handed stroke with the back of a club. This leads me on to what part of the club may be used to make a stroke. Rule 14-1 clarifies that the ball must be fairly struck at with the head of the club. Note that the clubhead includes the face, back, heel and toe of the club, but not the shaft or the grip. Another question that may arise is whether a player may continue to play with a club that is damaged. The answer is that if their club was damaged in the normal course of play they may continue play with it, repair it, have it repaired, or replace it with any club, Rule 4-3a. Conversely, a player may not continue to play with a club that has been damaged to an extent that it is non-conforming, if it was damaged other than in the normal course of play (e.g. in anger of frustration), Rule 4-3b. Note: For those of you that have not read the harsh decision of the European Tour Disciplinary Panel in the matter of English golfer, Simon Dyson, I recommend that you do so at this link. Why not treat yourself to my eBook for Christmas? I am confident that ‘999 Questions on the Rules of Golf 2012 – 2015’ will assist you to obtain a better understanding of the Rules of Golf, which in turn will help you to enjoy the game even more. Click here for details. I'm pretty sure a player can continue to use a club that was damaged during the normal course of play even if that club is non-comformning, eg, a bent shaft. Hi Barry where do the double faced or two sided clubs fit into the club count rules. You are correct, though I am not sure why they would want to when they can replace it. The clubhead must have only one striking face, except that a putter may have two such faces if their characteristics are the same, and they are opposite each other.